A listening and appreciation program by Lauren Fairbairn and Rob Fairbairn. Suitable for students in lower primary. Discover a world of music through your ears! 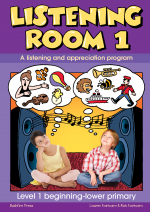 This fantastic resource includes 10 lessons in listening and appreciation for beginning-lower primary. It includes lesson plans, audio, charts, guided imagery, videos and outcomes tracking resources. The audio tracks, guided imagery and narration almost take the lessons for you! A perfect way to engage young students – with short pieces, lots of action & movement, some dancing and lots of animals (and an easy introduction to instrument families).